UltraLite® all-day comfort. This unique best-selling range from Toffeln has something for everyone. From functional to fun, patterned to plain, our fresh and innovative designs are loved the world over. By blending style and practicality with very durable materials, we have produced the ultimate feel-good experience for your feet. The difference is in the detail. Our foot beds are soft yet supportive, and their distinctive shape accommodates many different foot widths, enabling feet to spread naturally with plenty of room for the toes. We believe that comfortable work footwear, providing the correct support, boosts morale and significantly increases performance levels. This range of technically advanced footwear has been developed, enhanced, and improved thanks to our experience and understanding of the demands made, not only on the feet, but also on the body – day in, day out. Safety in the workplace is of paramount importance. Our adjustable heel strap design keeps your foot secure all day long. The padded collar provides all day comfort. 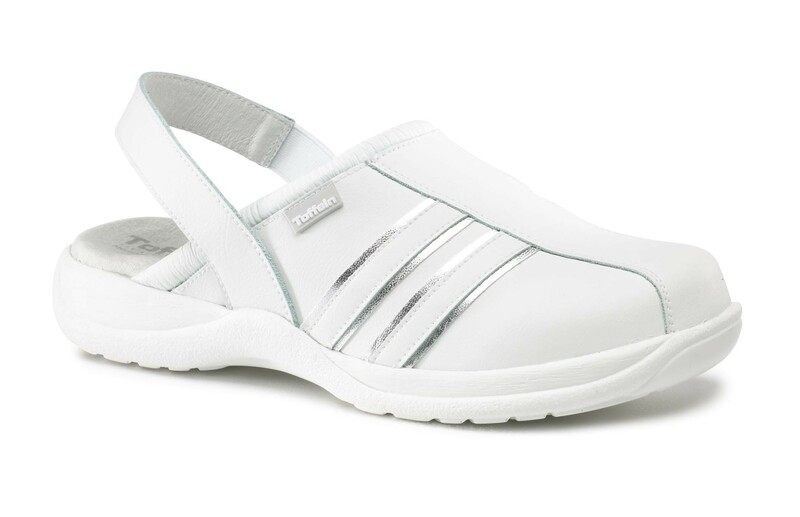 designed footbed also cushions and provides greater flexibility, ensuring healthy feet. Easy-to-clean leather uppers have a special polyurethane coating that resists fluid penetration. Gekko slip resistant soles are oil resistant and antistatic to avoid dangerous workplace accidents.